How can you have a professional dental career without any debt ? Is it possible to make $35/ Hr or more with no student loan debt . 1. Infection Control ( 8 hrs) ( Less than $500) for 1. and 2. 2. Dental Practice Act ( 2 hrs) 3. X-Ray Licence ( 5 -6 day program) ( $450-750) 4. Find an apprentice position to work in a dental office where they train you and PAY you. Yes you read it correctly !!! You can make $14-15 per hour while you train. 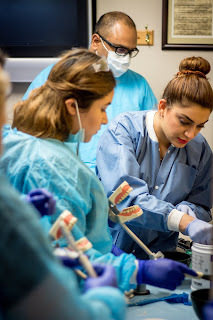 How can I become a Dental Assistant in the State of California ?